Currently, Order Inquiry only shows if the order is picked (after the picking ticket is printed), billed or invoiced. 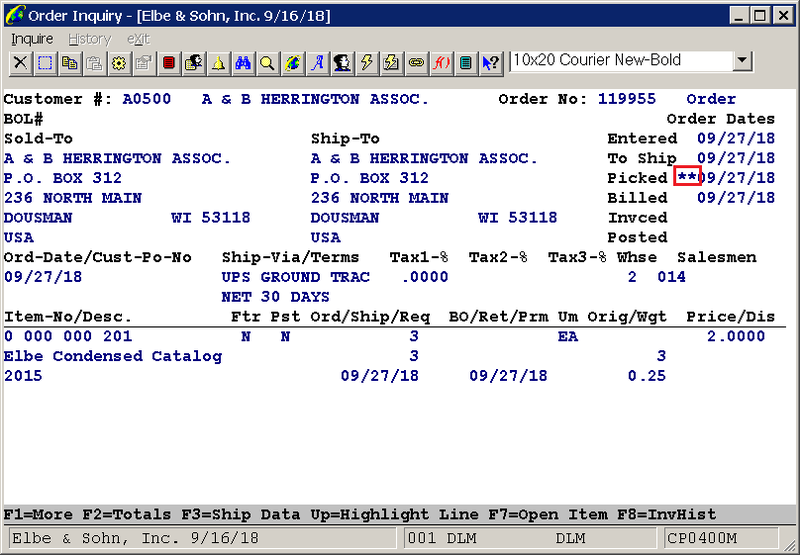 Many users desire to know more details of an order after the pick ticket is printed, before it is selected for billing or invoiced. Inventory Transfer Processing: This is applicable for multi-bin users. When a pick ticket is processed through this function, it implies that the inventory has been picked from the stocking bins and is now placed in the shipping area. Shipment Verification: This is an add-on feature to ensure the shipped order is scanned and verified for its content accuracy before it is packed and shipped. It is often used in conjunction with EDI UCC-128 label or VICS Bill of Lading. or order has a Tracking Number.